Unless you grew up or attended college in Southern Illinois, "Little Egypt" is probably low on your radar -- particularly if you’re a Chicagoan who thinks everything south of I-80 qualifies as Southern Illinois. In reality, the region is probably one of the Midwest's best-kept secrets. 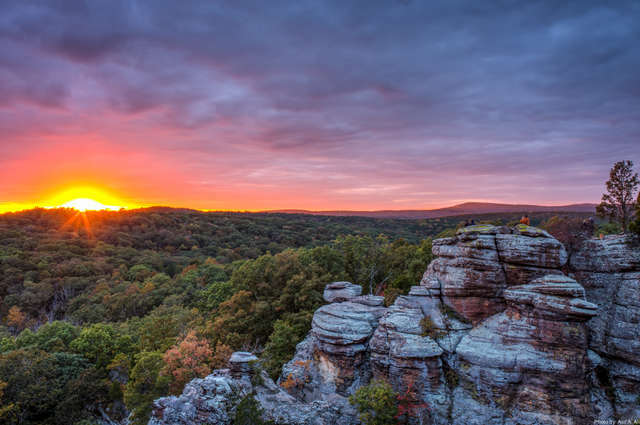 From its jaw-dropping natural beauty and deep history to its unique quirks, Southern Illinois boasts countless reasons why it's one of the most underrated parts of the US. Cahokia Mounds State Historic Site is thought to be the most sophisticated pre-Columbian civilization north of Mexico, and is one of only 23 UNESCO World Heritage Sites in the United States. The 2,200-acre site features several ancient mounds and Woodhenge, a timber circle thought to have been used as a calendar. While the city was home to an estimated 40,000 residents in the 13th century, it was mysteriously abandoned by the 1400s. Given that Illinois’ unofficial nickname is “the prairie state,” many people are surprised to learn that Southern Illinois is a great locale for climbing and bouldering. 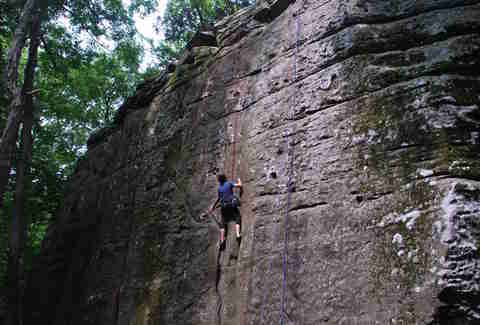 While much of the Midwest is stuck climbing at the local gym, Southern Illinoisans have plenty of places to do so, including Cedar Bluff, Drapers Bluff, Jackson Falls, Fountain Bluff, and Giant City. While Illinois may be known more for cornfields than grapevines, Southern Illinois actually happens to be home to more than 20 wineries and vineyards. In fact, there are two wine trails visitors can choose to explore: the Southern Illinois Wine Trail and the Shawnee Hills Wine Trail. The Shawnee Hills AVA region is best known for its chambourcin, traminette, chardonel, and vignoles wine... or in layman’s terms: “delicious wine." There’s nothing we love more than a truly bizarre roadside attraction. 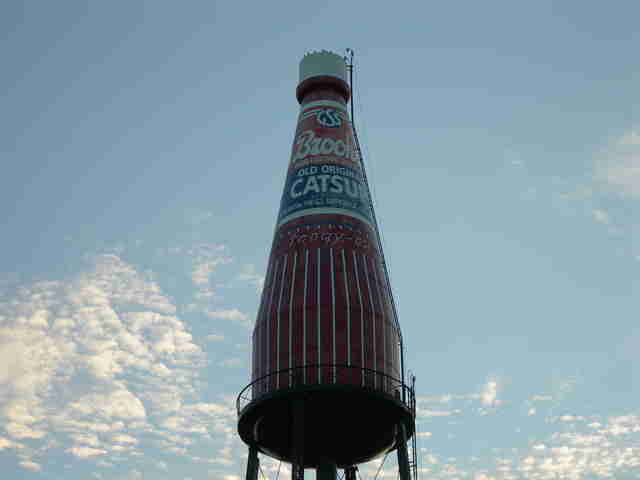 From the infamous World’s Largest Catsup Bottle in Collinsville to the 25ft Geriatric Walker in Edwardsville and Big John the Grocery Clerk in Eldorado, Southern Illinois is home to some of the weirdest ones we’ve had the pleasure of stumbling upon. So many strange and wonderful roadside photo ops, so little time. We know what you’re thinking: a diving site in landlocked Southern Illinois? Yes, we’re serious! Mermet Springs is an 8.5-acre spring-fed quarry with depths of up to 120ft. What makes Mermet Springs most notable, however, is the wide array of bizarre sunken items, ranging from several aircrafts (including a Boeing 727 from the movie U.S. Marshals) to a fire truck. Oh, and there's an underwater petting zoo, because no dive site would be complete without one, right? 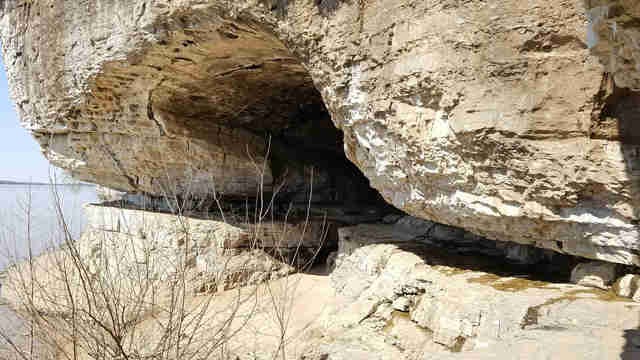 While it’s thought to have been used by Native Americans for centuries, Cave-in-Rock -- which sits on the bank of the Ohio River in Cave-in-Rock State Park -- was first discovered by French explorers in 1739. In the late 1700s -- right around the time the town of Cave-In-Rock earned the nickname "Ancient Colony of Horse-Thieves, Counterfeiters and Robbers" -- the cave itself was put into use by everyone from river pirates to the notoriously cold-blooded Harpe brothers, and even Jesse James himself. By the mid-1800s, vigilantes had raided the cave, and for a short time, it was even used as a church. 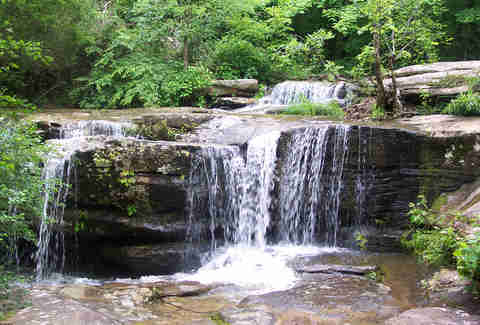 The jaw-dropping Shawnee National Forest spans a whopping 280,000 acres across the Ozark and Shawnee Hills, and contains seven wilderness areas, Giant City State Park, and Cedar Lake. The National Forest is also home to fascinating geological wonders, including Garden of the Gods Recreation Area and Little Grand Canyon. You can even go on a tree-based zipline canopy tour -- the only one in Illinois! 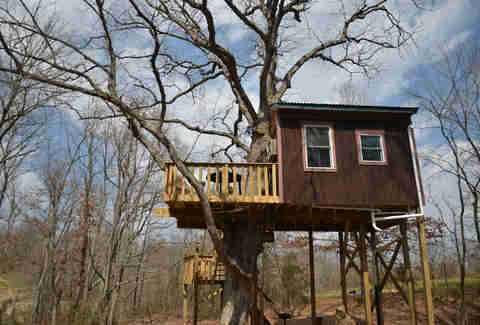 Live out your childhood dreams by booking a treehouse at Timber Ridge Outpost, Illinois’ only treehouse resort. While you may be sleeping amongst the trees, each treehouse is equipped with a bathroom, kitchenette, heating, and air conditioning. For those that prefer to keep their feet planted firmly on the ground, you can also rent out an authentic log cabin that was originally built in 1852. Two of the world’s favorite comic-book heroes -- Popeye and Superman -- have a heavy presence in Southern Illinois. Popeye creator E.C. Segar was born in Chester, IL, and the town has devoted the last three decades to paying homage to him by erecting statues of every single character along what is now known as the Popeye Character Trail. Roughly 100 miles southeast of Chester is Metropolis, the town DC Comics crowned "Hometown of Superman" in 1972. Bizarrely, the Illinois State Legislature also passed a resolution confirming that Metropolis is indeed “Hometown of Superman." 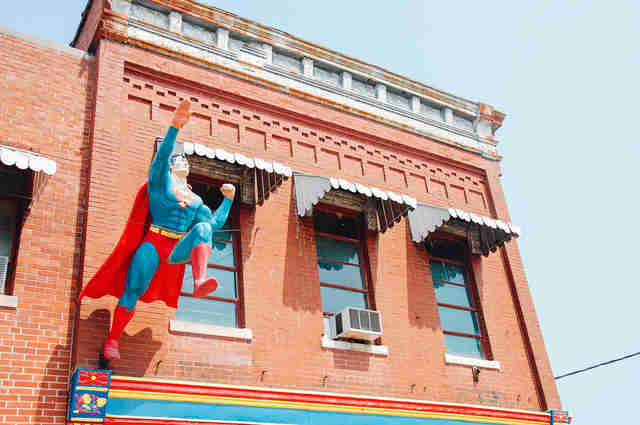 In addition to erecting a 15ft bronze statue of Superman, the town also throws an annual Superman Celebration and is home to Super Museum. While Southern Illinois may be home to a large number of university students, you’ll find that dive bars hold more weight than the stereotypical college bar around these parts. One of our favorites is Fast Eddies Bon Air in Alton, which was built by Anheuser-Busch in 1921 and has food so cheap, you’ll swear you’re paying old-school prices. Speaking of food, The Frosty Mug in Mount Vernon is known for its killer BBQ. For those that want the “dive” experience without the bar, swing by the Root Beer Saloon in Alto Pass. This teetotaling saloon has a truly bizarre interior featuring over 300 taxidermied items, a giant statue of King Tut, a diorama replica of a New York tenement from the 1930s, and more. If you’re claustrophobic, you may want to skip it. Sometime in the early 1900s, the proprietors of Jasper Banks Saloon in Olney, IL became the proud owners of a few albino squirrels. 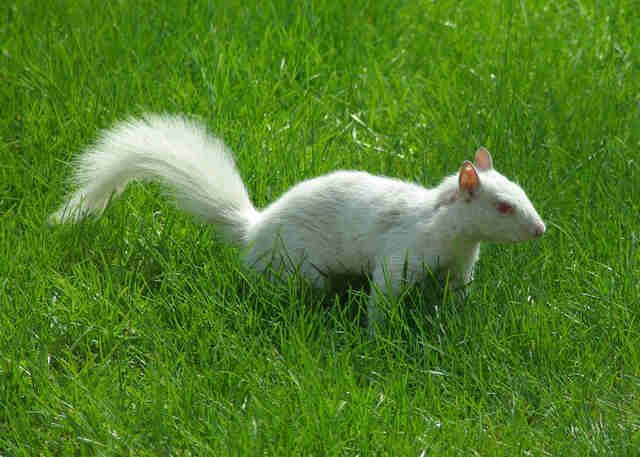 Over the years, the population of albino squirrels grew to 1,000 and became such a source of pride that the town officially adopted the strange little creature as its mascot. The albino squirrels have right-of-way on all public streets, and there’s a $750 fine for any driver who has the misfortune of hitting one. While we love taking full advantage of living in one of the world’s best food cities, we’ll never lose our affection for mom & pop restaurants. From the loose meat sandwiches at Maid Rite to the biscuits & gravy at Mary Lou’s Grill, Southern Illinois is filled with decades-old family-owned restaurants with food that’s so good, you’ll be swooning more than Guy Fieri hopped up on Donkey Sauce. Despite her best efforts, Lisa Chatroop still can’t break the habit of calling everything south of I-80 “Southern Illinois." Say hi on Twitter: @Chicagoista or DailyUrbanista.com.